The Auditors Are Coming! Just as you’ve been preparing to become compliant, audit firms have been preparing as well; determining what and how to verify and validate your disclosures. Also SEC Staff Accounting Bulletin No. 74 (SAB 74) will have an important impact on your disclosures as you get ready to submit 10K reports. These 10-K deadlines are coming soon so you need to be ready. 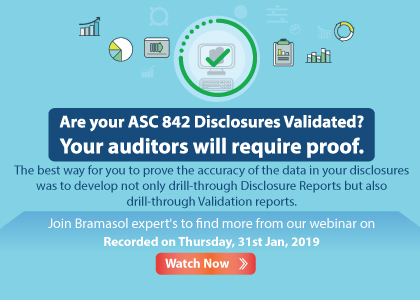 Bramasol has determined that the best way to prove the accuracy of the data in your disclosures is to develop not only drill-through Disclosure Reports but also drill-through Validation reports. Your proof is in the details. Join the Bramasol team to better understand the disclosure requirements and to see our series of purpose-built validation reports. In addition, learn how SAB 74 impacts your 10K reporting requirements for new leasing standards as well as revenue recognition and credit impairment.